Do you see him? I'll give you a hint he's slightly left of center and looks exactly like the jungle floor he's sitting on. 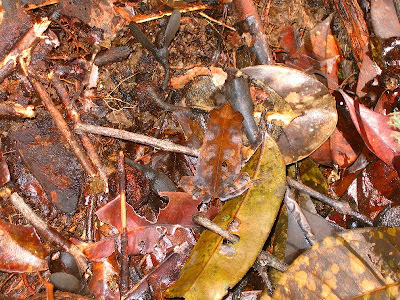 I have no idea how I found this expertly camouflaged guy as I was tromping through Brownsberg Nature Reserve in Suriname. I do love frogs and always keep an eye out for them but I think this beauty represents my best eagle-eyed effort. The most specific name I could find for this critter is "leaf frog." Brownsberg is about 100 km south of Suriname's capital city Paramaribo. I was only able to visit the preserve on a day trip but it was well-worth the drive with its endless deep-Amazon jungle walks and views over Brokopondo Reservoir. You can also stay over-night in the park in huts or dorms, which looked clean, comfortable and made me wish I could have stayed longer. 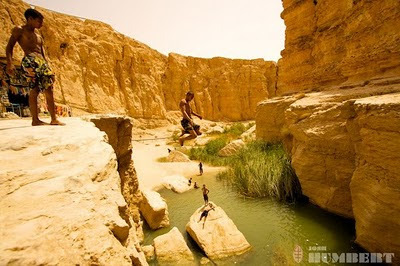 Mid-July heat in the Sahara is enough to make anyone want to jump off a 10-meter high cliff. This desert oasis is just south of the village of Tamerza, a few hours drive from the oasis town of Tozeur. There are several surreally lush pockets like this scattered throughout the area and we'd invariably find them deserted save a few local kids swimming and some sleeping vendors. But then tour buses would come through, 40 or so tourists would meander around for about 20 minutes, more vendors would appear out of nowhere then everyone would leave and we'd have the places to ourselves again. These local kids practice their jumping when no one is around then get tourists to pay them to jump when the tour buses are in. We watched a few scared kids jump for the first time during the quieter moments, getting nudged on by their older brothers. The water here was skin-piercing cold. It was wonderful. I didn't jump (I'm actually in this picture on the shore near my kids) but my husband Josh did. Dried coconut meat, also called copra, makes the world go round on nearly all of French Polynesia's outer islands. Coconuts are harvested off the ground in their ripest pre-germed stage, are cleaved in two with a machete then left out to dry in the sun. Next, the meat is extracted with a curved knife, called a pana in Tahitian, and the meat is dried again. This is the stage you see in this photo. Lastly, the coconut bits are stuffed in a sac, sold by weight to the local supply ships (known as "copra boats") and shipped to Papeete where the oil is extracted. 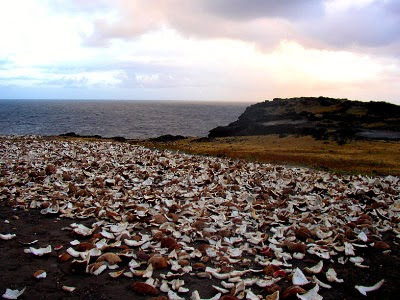 Ua Huka is one of the least visited islands in the Marquesas but it's my favorite. 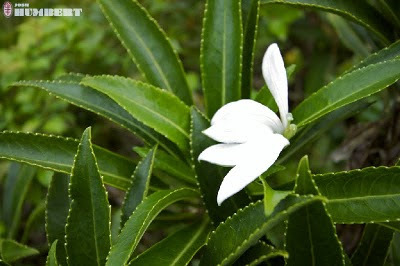 Lush valleys are concentrated with fruit trees (including over 20 species of mango) but the hills and coastal areas are open, grassy and decidedly wind-swept. I love that the locals let their copra dry out on the bare ground like this. On most islands people use elevated drying huts but everyone knows each other on Ua Huka and there's so much open space, why bother? There's a greater concentration of expert wood carvers on the island than anywhere else in the country, you can roam the hills on horse back looking for ancient pertoglyphs, fetch knotty tern eggs with the locals or search for the Marquesas-exclusive Ultramarine lorikeet, an electric blue beauty that's one of the world's rarest birds. Bunaken Island off of Sulawesi, Indonesia is known for its world class diving, so I was expecting the diverse, thriving and colorful undersea world we found - what I didn't expect was the plethora of walking trails through friendly traditional villages and a gentle culture where Muslims and Christians live harmoniously together. Everywhere we walked people would come up and say hello and maybe share a snack. No one was aggressively friendly like you find in some places in Indonesia; on Bunaken everyone was just downright pleasant. One sweet woman about my age walked with me for 45 minutes across the island and gave me a fabulous Indonesian lesson. 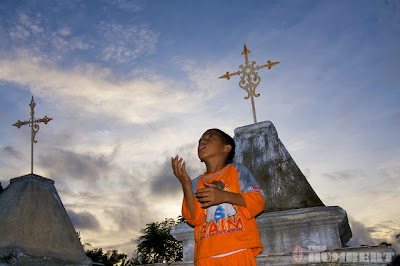 This photo was taken by Josh at the Christian graveyard in Bunaken Village - just down the road is the local mosque. While it looks like the boy is praying, he's actually flying a kite. With all the natural disasters going on lately, I admit I'm feeling a bit dark. I promise I'll get back to colorful, fun, tropical stuff on Wednesday but today, two days after the tsunami siren woke me up at 4am, I'm still preparing for the worst. So today's post is about the joys of dengue fever! No, it's not something we like to think about, but it's certainly something we should be ready for. I've had dengue fever three times, my husband has had it four times and both my kids have had it twice. Nearly everyone I know on Tahiti has had it - not surprising since WHO estimates that there are 100 million cases of dengue worldwide each year. Usually we don't worry about catching the virus since it comes in epidemics, but when we do start hearing about cases, especially in the neighborhood, out comes the tropical strength bug spray. 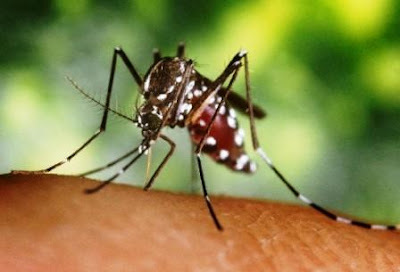 Aedes mosquitoes that carry dengue bite mostly during the day and the mosquitoes get infected by biting a human with the virus. The incubation period is about a week. Dengue is not subtle. One second you feel great, then a bit cold; within a half hour you have severe chills, feel extremely weak and know you are seriously ill. The fever rises rapidly and your head and entire body start to ache (this is why it's also called "break-bone fever"). At this point I curl up into a ball somewhere dark and just suffer for two to three days. TV sounds awful, your eyes hurt too much to read or even remain open and eating sounds like too much effort. Hopefully there is some caring person around to bring you liquids. 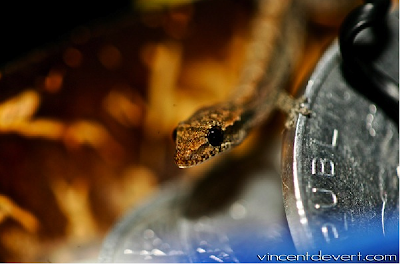 My husband once had a horrible strain of dengue that included vomiting and diarrhea. During this particular outbreak the sick children and elderly were airlifted off the atoll (we were living on Ahe Atoll at the time) but my husband had to get through it with just a bucket and me, his loving wife. Luckily I didn't get it that time but I seriously thought he might die. I've talked to doctors who believe that dengue is more dangerous than malaria, and many articles I've read concur, but once you get used to having it around, it's hard to think of it that way. We know what to look out for: if you start bruising for no reason it may have gone hemorrhagic and you need to get to a hospital; hemorrhagic fever is a potentially lethal complication that spawns from regular dengue. But otherwise, dengue is just something you have to wait out. Drink lots of liquids and take Tylenol for the fever but NEVER aspirin, which thins the blood and can also make the disease go hemorrhagic. Then there's the aftermath - a bunch of my hair usually falls out and once I got severely depressed for a month or so due to chemical imbalances created by the high fever. Dengue is something that requires recovery and I've never seen anyone just bounce right back to normal.